Running a successful ecommerce business takes a ton of work. You need to stay on top of a million tasks… promoting your products, providing excellent customer service, adding new products, updating your content, drive people to your website and come up with promotions to convert users into customers. With it now being easier than ever to setup an ecommerce shop with the likes of Shopify, the growing competition has made the tasks above even tougher! Getting someone to buy from your website is much harder than 10 years ago, users expect more from you! You can no longer just setup a few basic product pages and expect to compete on Google for Organic searches, or setup a simple Google Ad as their platform has evolved rapidly. 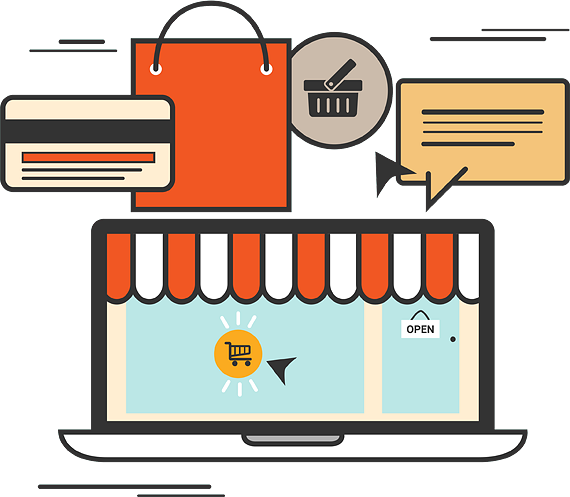 The complexity of running an ecommerce website is overwhelming, you now need to consider every step of the customer journey, understand your sales funnels, match search intent and optimise accordingly. People rarely impulse buy from a brand they’ve never heard of. Multi-touch journeys are the way common people buy, they might view your product on their smartphone, then their work computer (on lunch break of course! ), then their laptop and then finally purchase on their Tablet whilst browsing Facebook and seeing your re-marketing Ads in action. How can you help my ecommerce business? I take an overall view of your business and can also help in terms of logistics and identifying high performing products that you should push more, or help nudge that low selling product that you know should do better. I can help you bring all aspects of your ecommerce business to a high standard so you outperform the competition, so you can focus on growing your business. I have worked with multiple brand earning millions of pounds per year, purely from online sales and helped achieve better results by identifying opportunities through Audits and Analysis. Within 24 hours of ecommerce consulting I can help identify problem areas and opportunities for growth that are practical and realistic for your budget, that can transform your business swiftly. Driving the right people to your website is hard enough, but you need to convert them into customers. There are many areas on your website that could cause users to drop out at each stage of the buying process. I can point out these areas and fix them to improve the chance of a user converting into a customer. Finding new customers is a killer for most new businesses as they don’t know where to start. If you just sit back and wait for people to find your website then it’s highly likely you’ll fail. It’s vital to have a well thought out acquisition strategy and budget to target users who are likely to purchase from you. If Acquisition is done properly it can transform your business from a tiny unheard of brand into a formidable player in your niche. Selling to someone who already knows your brand and trusts you is much easier than finding new customers and convincing them to buy from you. Many businesses forget about people once they purchase and focus too heavily on chasing new customers. This is a dangerous strategy as it’s much easier and more cost-effective to encourage old customers to purchase from you. Build that long-lasting relationship from day one by building a brand people love. You may sell the world’s best tea, but if they aren’t presented well then you’re unlikely to sell much. You need to inspire visitors to your website and they need to be able to by from you with as little friction as possible. I can help you build highly converting product pages from my own personal experience to drive a free flowing customer journey. Not everyone who adds a product to their basket ends up checking out. Cart Abandonment is often ignored but it’s one of the most powerful areas to address and can drive revenue with some basic usability improvements. I can help you collect more emails address and build a healthy list of people who adore your brand and are eager to hear from you. Ensuring a stable sales channel that you can rely on for years to come. Understanding your visitors journey is vital to growing your ecommerce website. I have an expert knowledge of Google Analytics, I’m also certified in Google Analytics and can use it to identify opportunities that are costing you money. Uncovering a wealth of information to help you improve your website and drive sales. If your online shop is under performing our website audits can shed light on technical or design issues that are harming your conversion rate and client interaction. Much less than an agency! I’m realistic and understand that you need to be cautious with the amount of money you invest to get things growing. It isn’t in my interest to make you pay for something you’re not going to get any value out of. Your success is my success! It’s my job to help you achieve results that are within your budget, so you can grow at a realistic rate. That said, I am completely flexible to fit around you. We can agree a set number of hours each month or a price for a project before we start. I always deliver a lot more value than I charge for. I will always give sensible advice to match your budget and resources. I can provide advice or help via email, phone, Skype or on-site. Whether you need me just for an hour or for the entire day.